Which Garage Door is right for me? Choosing the right garage door for your home can be quite daunting nowadays. Not so long ago it was simple as there were only a few variations, now their is so much variation its difficult to know what the right solution is! But their is no need to worry, our trained technicians are on hand to help you make the right selection for your requirement. Garage have become an extension to the house and keeping them looking good is equally as important. With this in mind, garage doors can come in many different colours, finishes, thicknesses, openings and sizes to suit you and your home. Typically a standard single door size is 7ft x 6ft 6” or 7ft x 7ft and a standard double is 14ft x 7ft but these can vary. Why not get in touch with us here at Chapel Doors for a free no obligation site survey where we can discuss with you your exact options and afterwards provide you with a comprehensive quotation. Below we have tried to give ideas on the types of Garage Doors available as a starting point. Their are, or course, many variations on these but these are to give you an idea of where you might like to start your search. 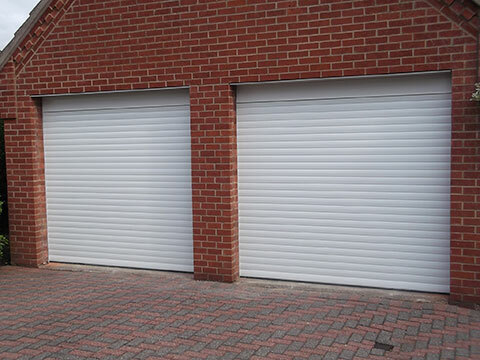 Roller garage doorRoller garage doors are the most promoted type of garage door in the UK simply because they are all generally made to order and with their operation mechanism they will fit almost any opening at all. The sizes available as domestic garage doors are generally up to around 5000mm wide and 3000mm high but there are suitable models above this size if required. The main consideration is to make sure the roller door you buy is manufactured by a company who really knows what they are doing as so many are 'knocked up' as a basic roller door with little finesse or regard to safety or legislation. We have listed the main manufacturers on this site and there are others we know but as simple as they may seem roller doors do have many moving parts and need to be manufactured and installed with a certain amount of precision to ensure a descent lifespan. They are an ideal door type in many cases as they open and close vertically and do not have tracks inside the garage. The basic roller door is the continuous steel curtain type although this does have a bigger roll than the more sophisticated aluminium insulated type. There are many variations on the insulated roller garage door in terms of the slat size used for the curtain, this also means there are huge variations in the colours and finishes available. 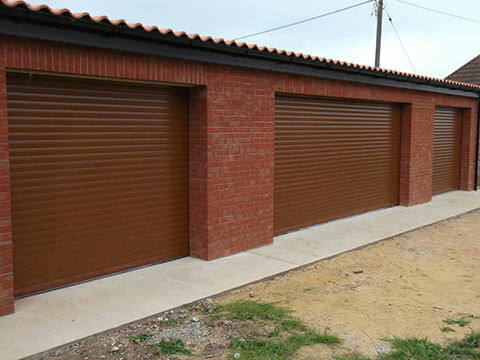 Most single width roller garage doors can be manually operated with the electric operation as standard but some doors have been designed as electrically operated from the outset. see the Seceuroglide, Hormann and Gliderol ranges for the main specialists in roller type garage doors in the UK. Quite a masterpiece in engineering the sectional garage door offers probably the highest levels of sealing, insulation (double skinned only doors), security and style of any garage door. The sizes are almost limitless as are the painted colour options and there are so many variations in glazing, design elements, gear options and surface finishes you should be able to find the perfect compliment to your house style. The sectional door opens and closes in a straight vertical action which also makes them perfect for the short driveways or even short internal garages as you can park right next to the door and still operate it unlike the up and over door which swings out and in when opening. Sectional doors are available in steel, timber and GRP but the majority sold are steel as the colour and design variations are numerous and in the double skinned panel versions they will offer the best of everything. See the Hormann LPU40 or Carteck GSW40 ranges to see the best in sectional garage doors. Hinged 'swing type' garage doors are becoming more popular again, especially as many people do not use their garage for a vehicle and require easy access on foot to many household items kept in the garage. 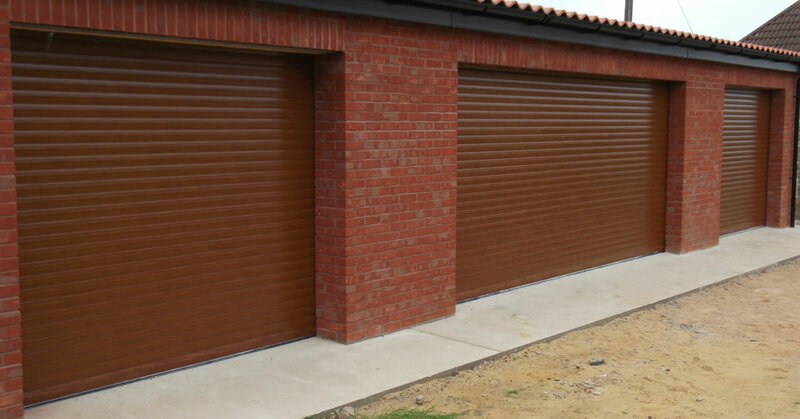 Also if the garage is used for anothe purpose such as a gym, office, storeroom, playroom, etc then there are a multitude of hinged doors available with excellent insulating properties as well as being very secure. We can offer hinged garage doors in steel, timber, GRP and double skinned steel with an insulating foam core along with matching side doors in many cases, if required. Many hinged dors can be produced in either a 50/50 split or a 70/30 split to give a smaller pedestrian door if constant access is required. Other websites advertise hinged timber garage doors but beware as you will usually need to purchase the handles, hinges, locks, etc seperately as well as a timber fixing sub frame finding you are then paying as much as a factory prepared doorset such as many of the ones now available on this website. It is also worth mentioning we only sell timber side hinged garage doors manufactured from cedarwood as it is a stable, generally knot free timber species offering many years of trouble free use if treated correctly unlike cheaper, knotty redwood or pine. 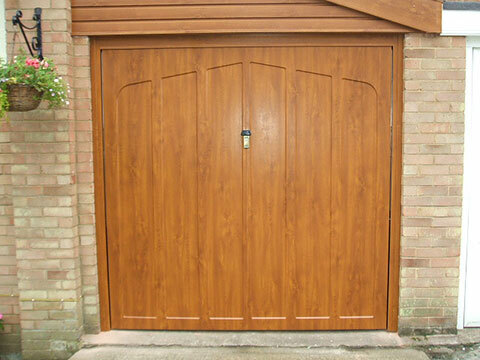 Woodrite and Cedar Doors are specialists in timber garage doors. 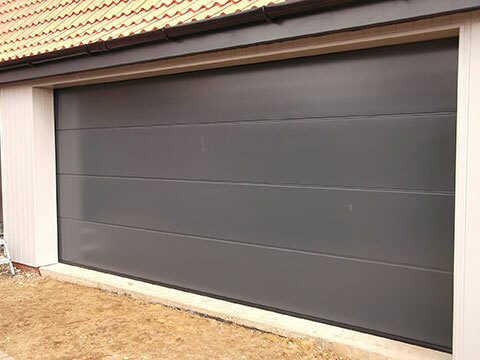 Steel and GRP side hinged garage doors are only made by a few specialist companies - Garador and Wessex being two of them. Insulated double skinned steel hinged doors in a double rebated steel sub frame are now made to order by Carteck and are now on the website to view. Please do not hesitate to phone or email for details and prices or visit the online shop. Ideal for single garage door openings up to about 3 metres (10 feet) as a manually operated door. Although they are manufactured over this size up to 4877mm wide (16 feet) sectional doors tend to be a better option in the larger sizes and a better price too. Up and over doors are in the main very easy to install, especially if you purchase the door with the optional steel fixing frame as the whole unit comes complete ready to secure to the garage opening with brackets. The double sized doors are a bit more involved with a seperate sub frame and obviously more weight to deal with. We would advise the up and over garage door if you simply want a door for a garage not requiring brilliant weather protection,sealing or even insulation although the Hormann, Garador and Novoferm doors are about as good as you can get, especially if ordered with the optional steel sub fixing frame and bottom seals. Another reason for having an up and over door is if you require a specific design in timber or GRP as the standard designs available for up and over doors are quite a lot more varied than others. The steel doors available are more limited in designs and will only ever have the smooth finish surface in limited colour options, although great if you want white as this is the industry standard colour.